If you cannot find the information you need on this page, please contact us directly. WHO IS NOOFLOW® SUITABLE FOR? IS NOOFLOW® A 100% NATURAL PRODUCT? CAN I TAKE NOOFLOW® PRIOR TO BEDTIME? WHAT IS THE MANUFACTURING QUALITY OF NOOFLOW®? IF I STOP TAKING IT, WHAT CAN HAPPEN TO ME? IF I AM UNDER MEDICAL TREATMENT OR TAKING MEDICINE, CAN I STILL TAKE IT? We are positive that Nooflow® will change your life for the better. Using Nooflow® is very easy! You can start with one vegetal capsule per day following your meal. After a few days, you can increase the dosage to two capsules in the morning or early afternoon. If you are not satisfied with the results, you can increase the intake in one-capsule portions until the desired results are met and the dosage has been adjusted to your individual substance tolerance. *Suggested use for adults only. Nooflow® is a 100% natural nootropic blend that provides support for your short- and long-term memory, your ability to learn and process new information, your concentration and focus levels, as well as your mental and physical energy. Furthermore, this premium nootropic supplement is very effective against certain depressive conditions and improves overall well-being by efficiently lowering stress and anxiety levels. Our premium nootropic blend is formulated and designed primarily for people with low energy levels, people with a highly demanding lifestyle or those who simply want to improve their memory and cognitive functions. Nooflow® is very effective against certain depressive conditions, eliminates brain fog, social anxiety and enhances overall well-being. Anyone going through a stressful phase of life and looking for a sharper mindset can obtain larger benefits from Nooflow®. Nooflow® is suitable for all adults* who want to go beyond the full potential of their mind and body. * Do NOT use this product if you are pregnant, nursing or under the age of 18! Yes! Of course, Nooflow® has 100% natural ingredients. All of the substances included in it are carefully selected natural nootropics, herbal extracts, essential vitamins and antioxidants. 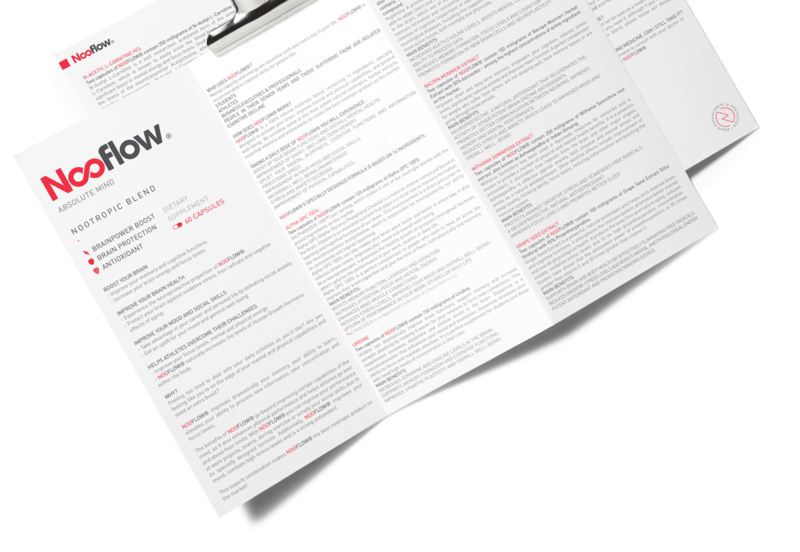 An independent laboratory test is conducted for every single batch of Nooflow® produced. Hence we can guarantee that only the purest forms of all ingredients are invested in our premium nootropic blend. For more information visit the Ingredients page. There are 60 vegetal capsules in one bottle of Nooflow®. A single packaging of Nooflow® will last for a whole month if you follow our recommended dosage. For more information see the Dosage Recommendation section. The recommended Nooflow® dosage is two vegetal capsules per day following a meal. Since each person reacts individually to external substances, the appropriate personal dosage may vary. We advise starting with one vegetal capsule a day. After a few days, you can begin to increase the intake with one capsule at a time until you are satisfied with the results. Some people experience remarkable positive effects, even with one capsule of Nooflow® per 24 hours. Can I take Nooflow® before bedtime? Since Nooflow® tends to stimulate the brain, we do not advise taking it before going to bed or in the late evening hours. For more information visit the Dosage Recommendation section. No, Nooflow® is a dietary supplement with natural ingredients. Nooflow® is not intended to diagnose, treat, cure or prevent any disease. Nooflow® is manufactured and encapsulated by the highest standards in the industry in an EU GMP (Good Manufacturing Practice) certified facility near Barcelona, Spain. All ingredients invested in our product are carefully selected from the leading laboratories in the field. Every ingredient is of medical grade purity, clinically tested and with proven qualities. Additionally, each batch of Nooflow® is tested by a third-party, an independent laboratory. Hence, we can confidently guarantee the highest quality of our product. Nooflow® is a dietary supplement with natural ingredients and should not be seen as a medicine. Each substance in our nootropic blend is carefully selected and clinically tested. 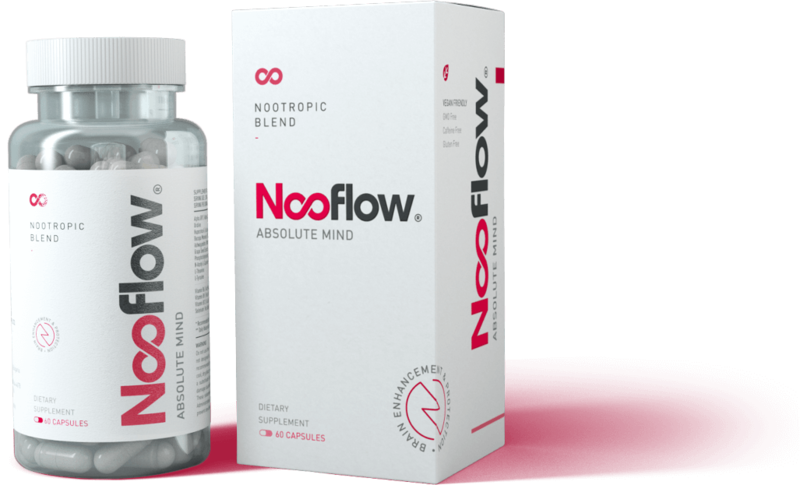 Nooflow® enhances brain functions and general well-being in a natural way, without any harmful ingredients thrown into the mix. You can stop taking Nooflow® anytime you want without the risk for any side effects. You can also take it only when needed. However, if you want to experience the full potential of our product, please follow our dosage instructions. If you are under medical treatment, we recommend consulting with your doctor or health care practitioner before you start taking Nooflow® or any other dietary supplement.